Hennessey’s new HPE750 Supercharged Mustang was tested to 207.9 MPH. My personal transportation needs require at least 208 MPH, so while this car is not for me, for under $70,000, it’s still a hell of a deal for those who need to go really, really fast. 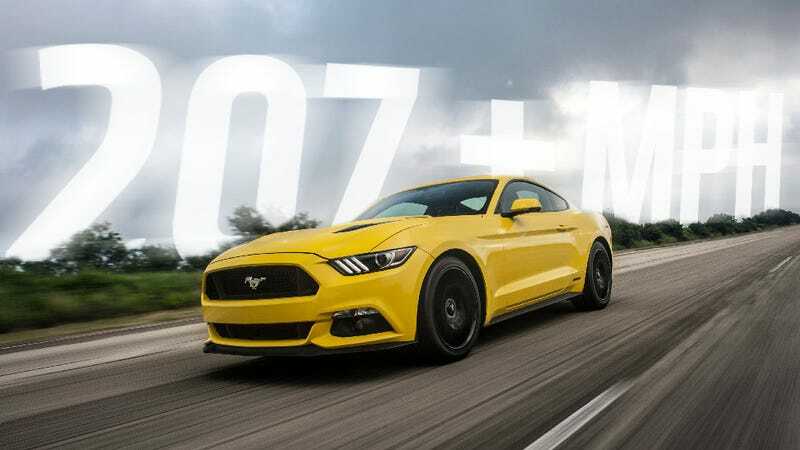 This speed makes the HPE750 the first 2015 Mustang variant to break the 200 MPH barrier, long known to be one of the average Mustang owner’s primary requirements for their cars. The high-speed run happened on Continental Tire’s 8.5 mile high-speed oval track, and the event was witnessed by Jay Leno, who was both shooting an episode of Leno’s Garage and a pilot for a possible new television show, Jay Leno Witnesses Events That Occurred. “If at first you don’t succeed, just add more horsepower and rpm and try again. It’s pretty cool to be able to offer an American muscle car that delivers supercar performance for under $70,000. In the context of a supercar, it is pretty amazing that 200+ MPH speeds are now available for cars well under $100,000. It’s a fascinating feat of modern engineering, and, sure, maybe a little useless, but just knowing that a car can go a given absurdly high speed seems to be the key criteria for sales. Please note that the “Hennessey Premium Floormats” are the only Mustang floormats tested to over 200 MPH.